There was a sense of inevitability that, at some point, United would click into gear and results would follow performances. We had been playing so well that it was impossible to see how we could keep dropping points and, on Saturday, it all came together. If we had won the fixtures against Stoke, Burnley, Arsenal. West Ham and Everton we'd be right in the mix for the title. We're now converting those draws into important wins and if you'd offered us sitting four points off second at Christmas we'd have taken that. Chelsea are the best team in the country at the moment by far and deserve to be where they are, but United are not far behind in terms of performances. Victory at West Brom extended our unbeaten run to ten games and was our fourth win in a row, but it was the manner of it that was the most satisfying aspect of a good night's work. There was the nervy win over Spurs, the harum-scarum late drama at Selhurst Park but, at the Hawthorns, we dominated the game from start to finish. West Brom away looked another difficult hurdle for United to clear, with the Baggies on a run of four wins from six and three in a row at home. Tony Pulis sides are notoriously hard to beat but we despatched his in-form outfit with ease and without breaking sweat. It was the most complete and controlling performance witnessed since the retirement of Sir Alex and was our best away display of the season. Contrary to what many believed when he was appointed, under Jose we're playing the best brand of football I've seen from a United side in years. This was a classic Mourinho performance: his tactical plan and in-game management were executed to perfection, every player knew his job and the team were clinical, efficient and organised. The team are clicking, everything is coming together and the players are fighting for their manager, the fans and each other. 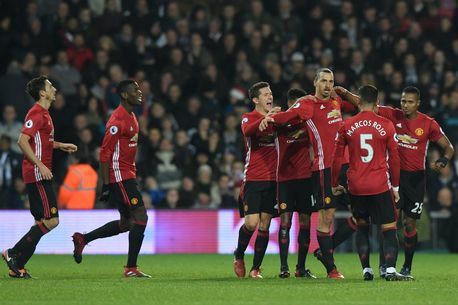 The result was never in doubt from the moment Zlatan put us ahead early on. The collective performance was one to behold, but there were also many superb individual displays from those in a United shirt. Mourinho is very much a momentum manager: when he finds a winning formula, he very rarely changes it. We saw that in his last title win at Chelsea when he used only 19 players throughout the whole season and we're seeing the same now with his United side. It's no co-incidence that our recent consistency and momentum-building run has come with the same core of players. Jose has kept the line-up pretty much the same and the team are reaping the rewards - a bright 2017 beckons.